The reality for marketers today, is they operate in an increasingly complex and rapidly changing market – the new paradigm is one of disruption, competition and commoditisation. Marketers are now forced to contend with continual shifts in technology, data and consumer behaviour, coupled with super-connected, always-on consumers whose expectations are that their experiences will be personalised, contextual and device relevant. Fast-forward five years and the way brands engage with customers will have shifted again. Customer experience will have progressed from a strategic imperative to a brand’s competitive advantage. The social service model of always-on customer experience will be the norm rather than the exception. The Internet of Things (IoT) will see a rapid change in life-enhancing technology that enables better interactions in the home and workplace, with customers expecting ‘on-demand’ interactions from brands. Today’s business mantra of ‘profit before purpose’ will have transformed too. In its place, organisations will address their wider stakeholder need for a sense of higher purpose. Research recently released by PWC at the World Economic Forum shows CEO’s believe that 85% of customer purchase decisions are currently ‘based on convenience and functionality’. This is expected to drop to 58% by 2020 in favour of purpose-led decisions. Purpose provides meaning and focus by expressing the brand’s role in culture, its reason for being and how people will connect with it. Purpose defines the brand’s behaviour both internally and through every customer experience – its people, customer interactions, products, services and communications. Importantly, purpose provides an authentic narrative. 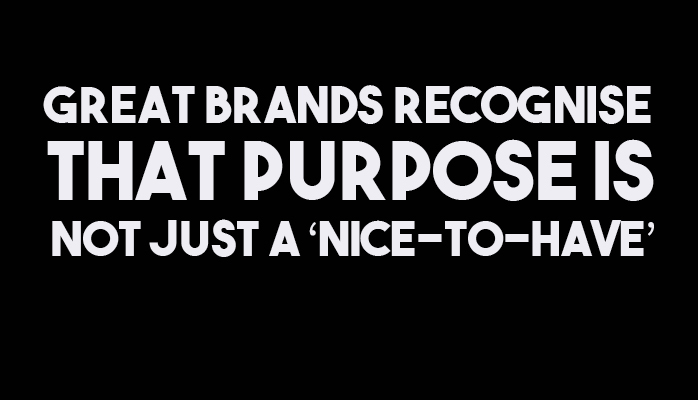 Many great brands recognise that purpose is not just a ‘nice-to-have’. Brands such as Apple, Disney, TOMS and Chipotle know what their brand stands for in people’s lives and have weaved their purpose through shared values into the central fabric of their culture. How their employees think, act and communicate comes not from what they do, but ‘why’ they do it – they understand their customers and know their truth, their needs and how to fulfill those needs. A higher brand purpose or social purpose is built on an organisation’s moral conviction and obligation to do the right thing; for the business, for society and for the planet – resolving to improve the lives of people and be a force for social good that’s bigger than profit. Jim Stengel, author of Grow: How Ideals Power Growth and Profit at the World’s Greatest Companies, is a leader of the movement for creating ideal-driven brands. His point of view is that businesses with higher ideals build deep, authentic relationships that shape rituals, systems, processes and culture; influencing the behaviours inside the organisation and impacting the experiences that people have. In collaboration with research company Millward Brown Optimor, Stengel identified that the key driver of extraordinary financial success was that each organisation had a clearly defined higher purpose as a central tenet of their business strategy. The research demonstrated how these brands outperformed their competition in brand value and financial growth, with many of the brands maintaining a price premium. Importantly, purpose enables business leaders to effect organisational change and improve business performance. This is the type of transformation that requires change from the top. Research shows that brands that are clear on their purpose benefit from having higher employee engagement levels, which in turn has a powerful correlation to customer engagement. Customer purchasing preferences are changing too. The Millennial generation is now the heartbeat of consumer culture – influencing and accelerating shifts in consumer attitudes, spending habits and brand preferences among older consumers. This is a generation that engages with brands extensively, personally and emotionally, believing that brands can bring about global change and a positive contribution to society – great purpose-led brands inspire and empower customers in support of their social movement. Founder of the global footwear brand TOMS, Blake Mycoskie, was inspired to start the company after a visit to Argentina where he met children so poor they couldn’t afford to buy shoes. His pledge was that TOMS would donate one pair of shoes, (in developing countries), for every pair sold. Since founding the business in 1996, TOMS has donated more than two million pairs of shoes, with approximately one million of those pairs donated in the past two years alone. Analysis of the buy-one–give-one model by Stanford Social Innovation Review concluded that the buy-one-give-one model is not only a viable way to create both commercial and social value but also a model of social entrepreneurship that is likely to increase in prevalence and power to influence consumer purchasing decisions. People today seek emotional connection and inspiration. Purpose-led brands give them a reason to believe that the company is built on the higher ideal of greater good, not just profit. In an increasingly competitive and commoditised world, it is the authentic and meaningful interactions that are the powerful connection in how customers experience brands. My focus is connecting customer and culture to empower customer-centric growth; fostering a culture of customer centricity, building team capability and helping transform customer experiences. 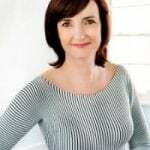 With a 20 year track record in leadership, operations and marketing, my strength is developing customer experience strategy: customer understanding and empathy, experience vision and guiding principles and the customer narrative to enable collaboration and alignment. I am the principal of the customer experience consultancy, All Work Together; authored the book Customer Experience is the Brand.